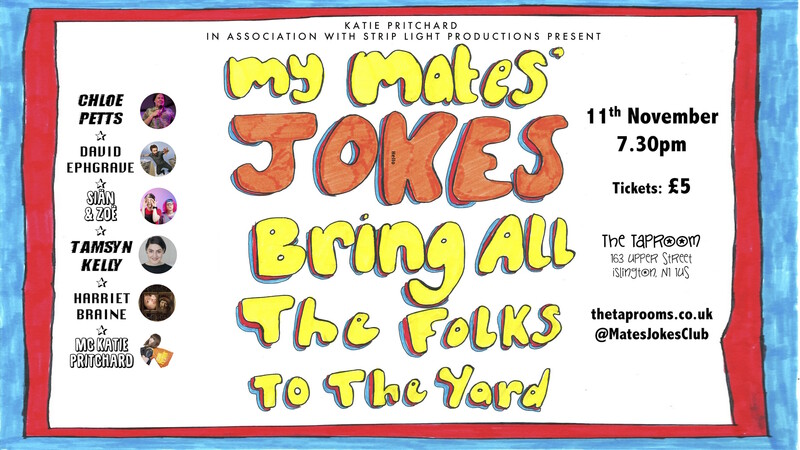 Join musical maniac Katie Pritchard and a whole heap of her favourite comedy pals for a night of entertainment. With a one-person house band (Me, on my own, like the coolest person you know amiright?! ), games, drinks, fun, and all the laughter you can handle with the snazziest of line-ups imaginable!! She has appeared on Channel 4’s Random Acts and BBC 3 Quickies. We’re at maximum PHWOAR-ABILITY this month!!! Tamsyn is amazingly hilarious and I’m so chuffed she’s coming to join in the fun! Tamsyn Kelly has supported Seann Walsh, Omid Djalili, and Jessie Cave, she has also appeared with Russell Kane on Rage Room (Channel 4), as well as Things You Shouldn’t Sayon BBC3, and on Radio 1 as part of The Andy Field Experience. Tamsyn directs and performs drag and was a finalist in Man Up 2018. She has recently finished directing her first run of News Revue, and directed Sh*tfaced Showtime’s hit run of The Wizard of Oz at the Leicester Square Theatre and Edinburgh. KLAXON!!!! David and I were in a band together, and a show! WHAT A BABE! David Ephgrave is an actor, musician, and comedian – and back end of the comic duo Doggett & Ephgrave. Most recently, he was amongst the Daily Telegraph’s and Comedy Central’s Funniest Jokes from 2017 Edinburgh Fringe lists. Among the Daily Telegraph’s 20 Funniest One-liners and Comedy Central’s 35 Funniest Jokes from 2017 Edinburgh Fringe. Oh, boy! Am I excited to be joined by this technicolour sketch hazard! Not only the coolest two-some in sketch comedy but also super snazzy comics in their own right. Team them up together, and prepare yourselves for an absolute snazz-fest! AND ALL MC'D BY KATIE PRITCHARD (that's me)!!! So, what are you waiting for? Nab a ticket before they all disappear, and come and join in the fun times!!! It’s only £5 for what will be an incredible night of comedy PHWOAR LOOK AT THAT LINE-UP!!!! No step-free access at the venue I'm afraid. If you require help with access, do not hesitate to get in touch, and we'll do our best to accommodate. PHWOAR U R SO SNAZZY!